available on the races at TVG, Xpressbet and other offsite wagering facilities. 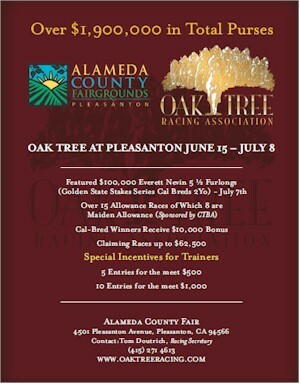 Horse racing in California was initiated over 100 years ago in Pleasanton and has been a historic tradition ever since. It is a place you can come to enjoy the Fair as well as thrill to the horses, providing exceptional excitement and a view of western history. With a Fair providing fun and knowledge to all ages, tantalizing food and racing excitement, there is something educational and pleasurable for the whole family.